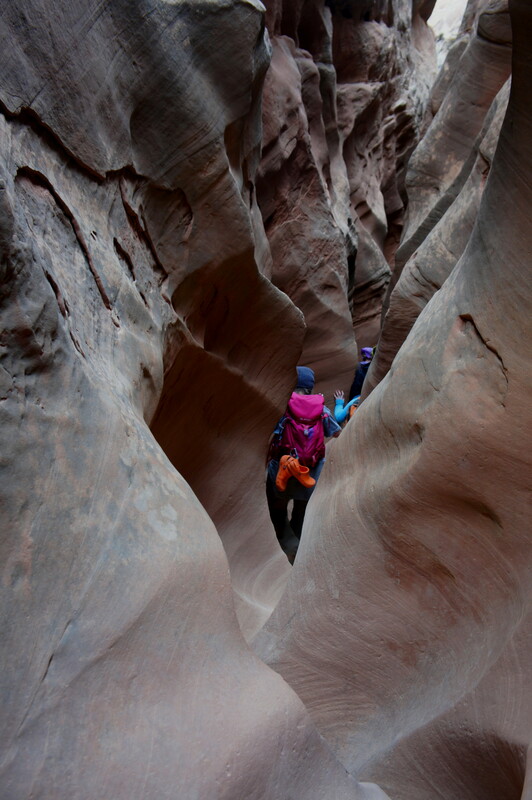 As far as non-technical slot canyons go, Little Wild Horse Canyon in Utah’s San Rafael Swell is among the best of the best. 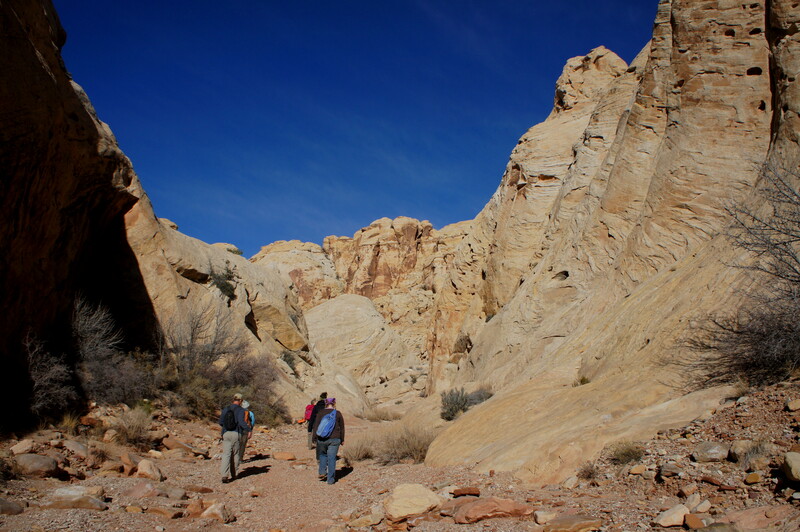 Tight, picturesque narrows, sweeping sandstone domes, and honeycombed walls make Little Wild Horse the most popular hike in the area. Visit in winter or early in the morning to avoid crowds, and consider making it a loop trip—by combining Little Wild Horse with a hike through neighboring Bell Canyon. 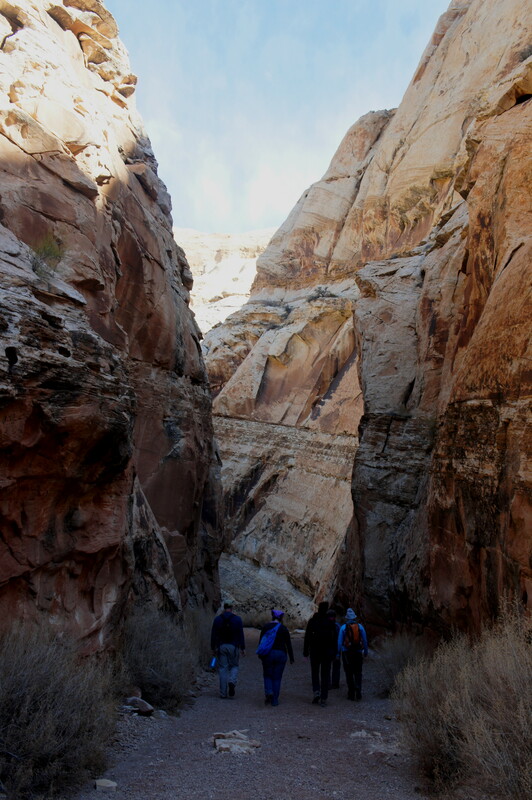 Though no ropes or climbing equipment are required, each canyon has just enough obstacles to challenge loop hikers. 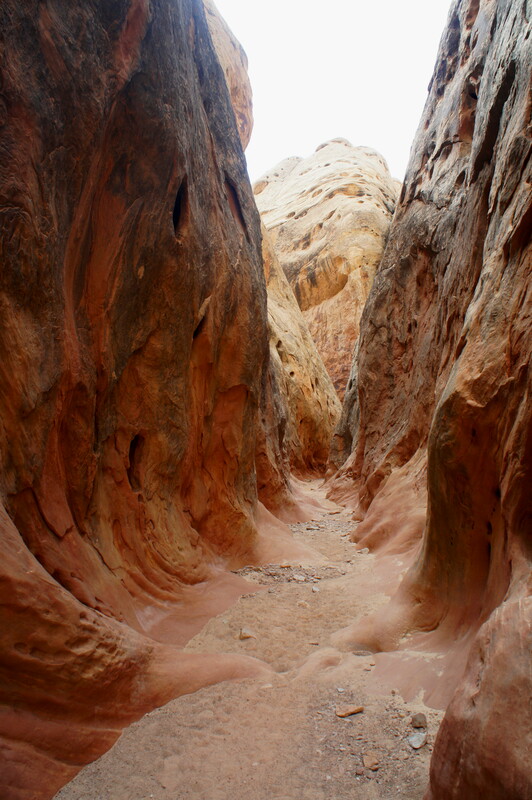 The hike begins just to the right of a large pit toilet, and the sandy trail quickly drops into a dry wash bed. 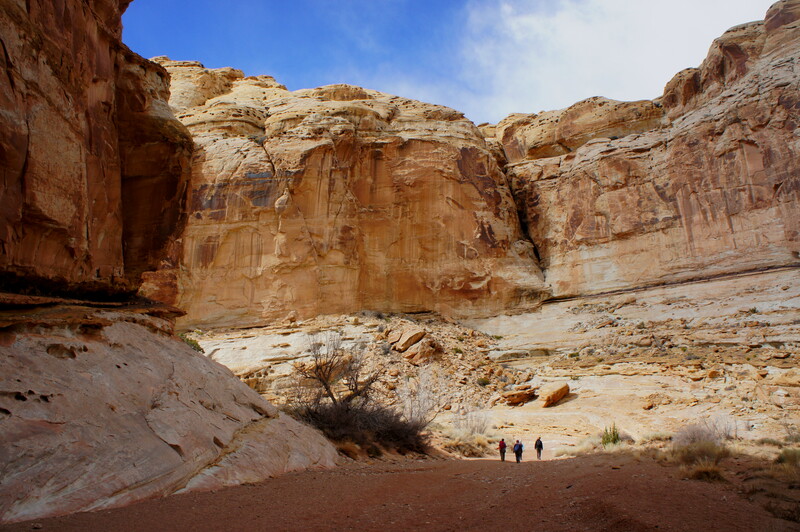 Here you are entering the San Rafael Reef, a 75-mile long anticline composed of sedimentary rock layers deposited during the Jurassic period. Green and tan walls give way to short cliffs and ledges of the Kayenta formation, while gnarly Fremont cottonwood trees dominate the wash bottom. 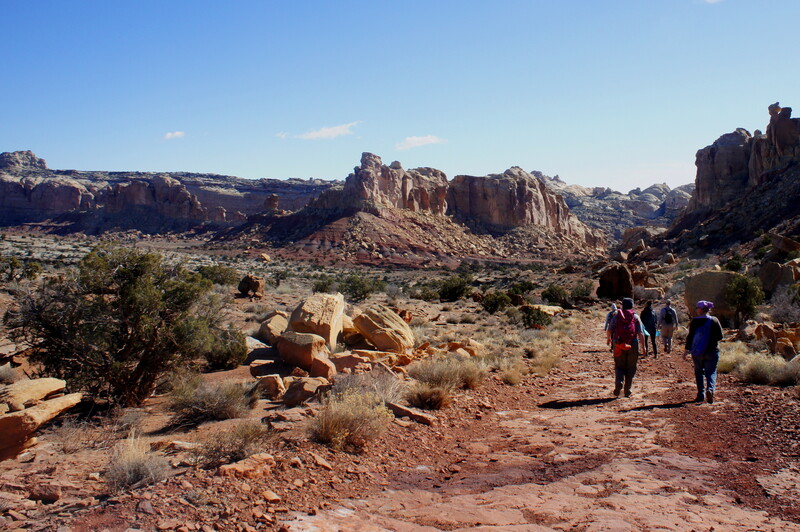 4/10 mile up the sandy wash, hikers encounter the first of many obstacles—a short drop-off in the Kayenta slickrock. Surmounting the 8-foot pouroff is a real chore; hikers will instead want to climb a tiered shelf on the left, or backtracking 10-20 yards to a steep bypass trail. Judging by the number of small children who make it beyond this point, this obstacle should not be a problem for most. Another 1/10 mile brings one to a canyon junction. An obvious sign in the middle points left to Bell Canyon, right to Little Wild Horse. It’s possible to complete the loop in either direction, but hiking clockwise—up Bell and down Little Wild Horse—avoids some difficult 10-12 foot up-climbs in the upper reaches of the Little Wild Horse section. While Bell Canyon has its fair share of obstacles, no barrier exceeds a height of six feet (with the exception of a couple higher pouroffs that are easily bypassed). The most challenging obstruction in Bell, a six-foot dryfall, is encountered about ¼ mile from the canyon junction. Many hikers will benefit from partner assistance—either a boost or a hand—to surmount the pouroff. Aside from a handful of small boulder piles, the only additional obstacles are periodically-occurring pools. Barring a visit following a major storm, however, standing water is relatively easily avoided by way of minor stemming. Bell Canyon features roughly 2/3 mile of narrows, rarely thin enough to be considered a “slot” yet a nice teaser for what’s to come. 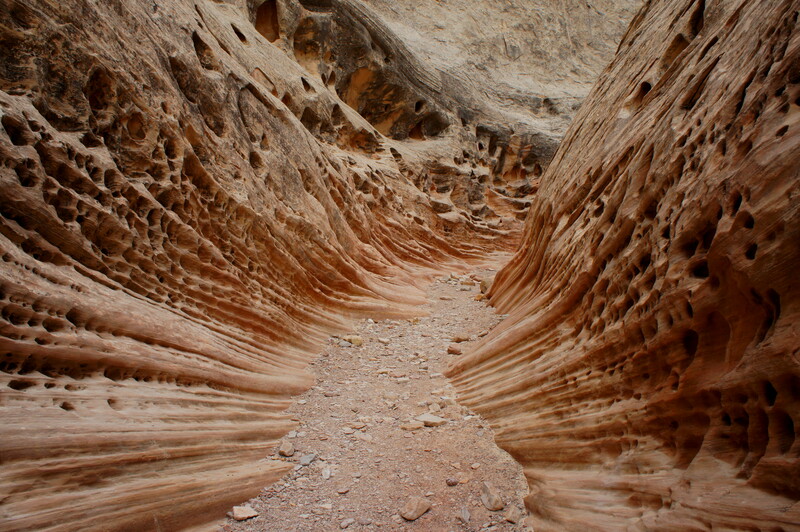 The narrows have been carved into the predominantly cream-colored Navajo sandstone, occasionally stained red (by way of iron oxidization). In some ways, the open spaces are as impressive as the tight spots, as the shining sun illuminates the cross-bedded and pockmarked cliffs. The second (northern) half of Bell Canyon features mostly these spacious areas, though there is one section approximately one mile from the junction where the wash cuts between two high walls, forming a picturesque entryway of sorts. 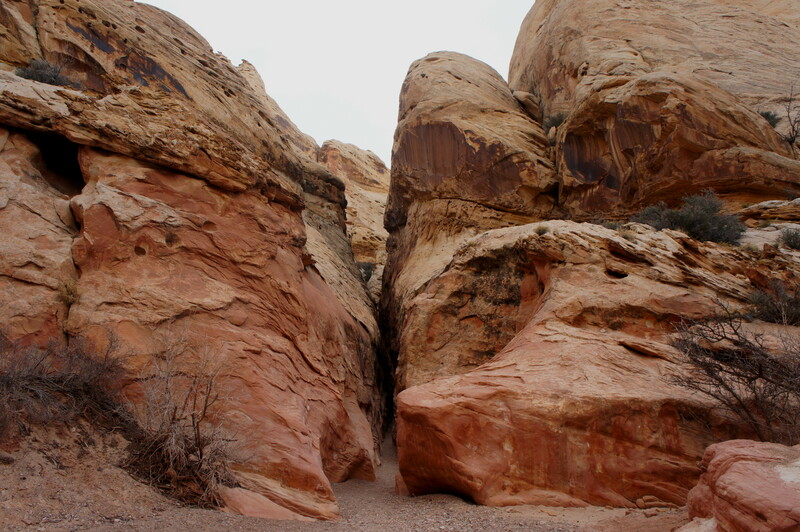 Shortly thereafter, the Navajo walls give way to ledgey Kayenta, where hikers must navigate a smattering of obstacles. All are relatively easily climbed or bypassed. 1.8 miles from the junction—and 2.3 from the trailhead—the dry wash intersects with the Beyond-the-Reef Road, a rough 4WD track. 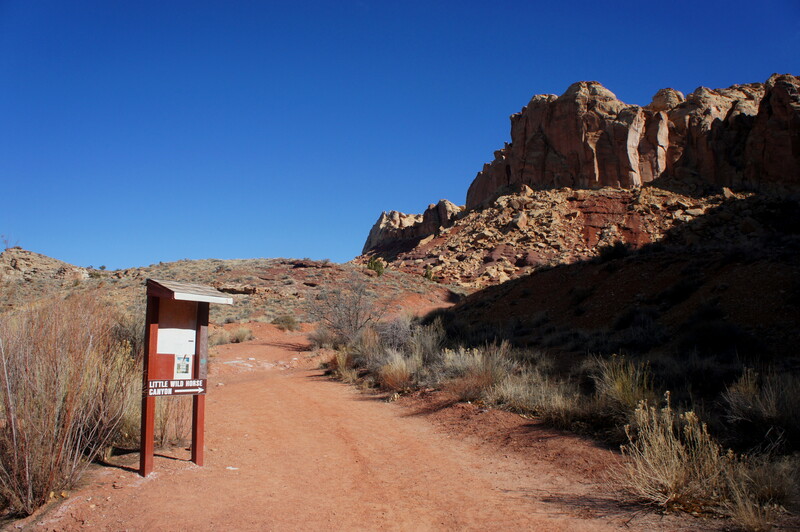 A sign, easily-spotted, points east to Little Wild Horse Canyon; the next 1.6 miles will require walking on the road itself. At this point, you have made it through San Rafael Reef and are greeted by the wide open expanse of Sinbad Country to the north. 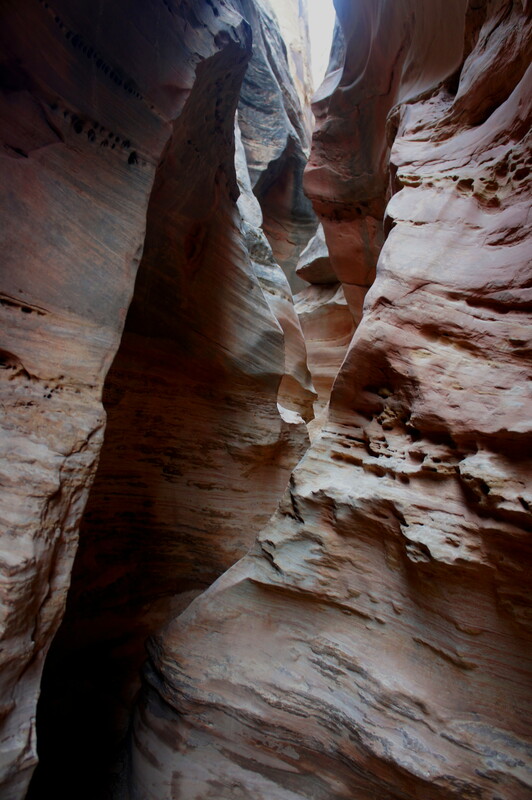 This area is remote and difficult to reach by passenger car yet contains a number of interesting slot canyons (mostly for canyoneering types). From here, the relatively flush terrain appears in stark contrast with the towering walls behind—miles and miles of cliffsides composed of yellow-orange Wingate sandstone. It is into this uplifted anticline that Little Wild Horse and Bell Canyons cut. The first mile of the road portion accounts for more than half of the hike’s total elevation gain (370 of roughly 700 feet in all). On a hot summer day, the sun-soaked walk can be enough to sap the energy of a loop hiker. So take the persistent climb slowly—stopping frequently if necessary to take in the views. After nearly a mile on the road, the dirt track crests a hill and begins a gradual decline toward the entry to Little Wild Horse Canyon. At the 3.9-mile mark for the hike, leave the road and follow the wash bottom downstream at another conspicuous sign for Little Wild Horse. Here you have entered a significant tributary of Little Wild Horse that, after less than a half-mile, meets up with the main canyon itself. It’s hard to imagine that Little Wild Horse Canyon, at this point quite broad and flat, will soon become a tight, meandering slot. 200-foot walls of Wingate dominate the landscape on either side, but they are far from touching. 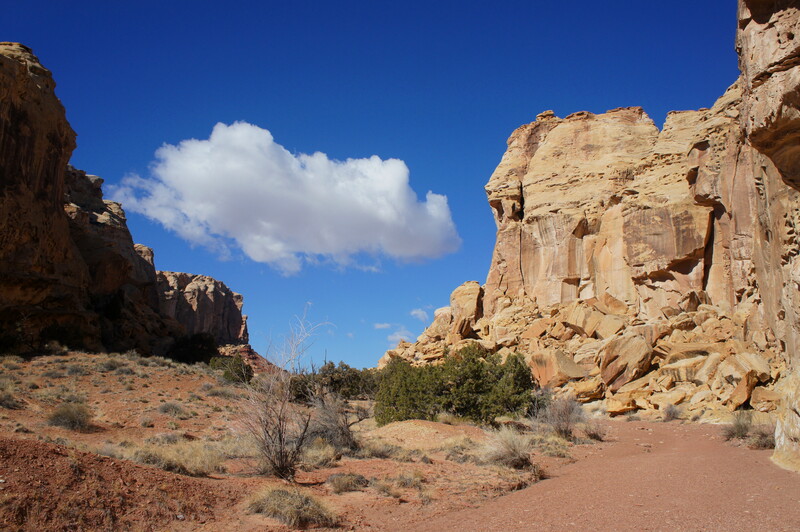 It will take descending to the next rock layer—the Kayenta formation—for the canyon walls to constrict. 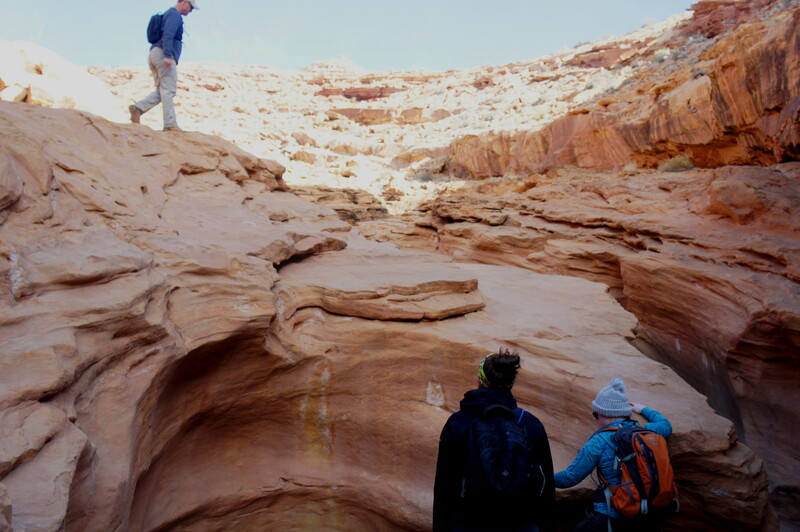 The Kayenta appears a little less than a mile from the road and plays host to perhaps a half dozen obstacles, including a pair of 10- to 12-foot dryfalls. Both can be bypassed—or simply conquered by way of a controlled slide. Neither would be too enjoyable to attempt to climb up. 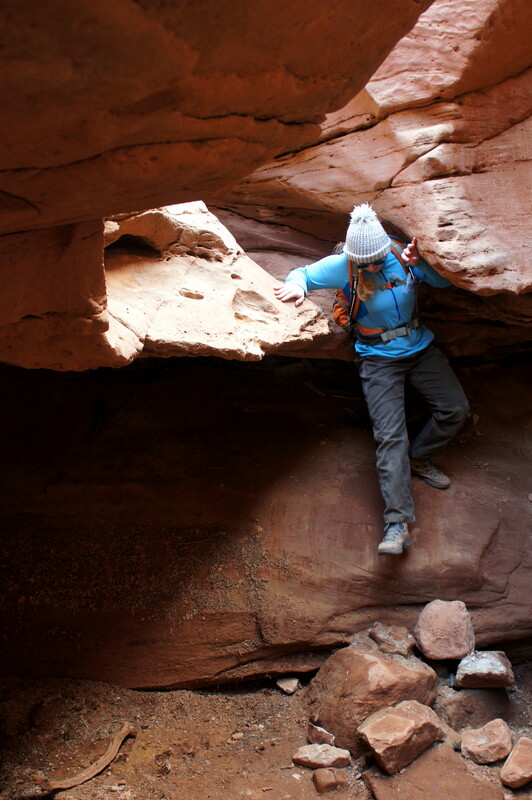 The toughest obstruction comes at the end of the Kayenta, as hikers spiral out of a twisted slot and drop 5-6 feet into an interesting bowl sometimes filled with water (it was dry as of February 2015). 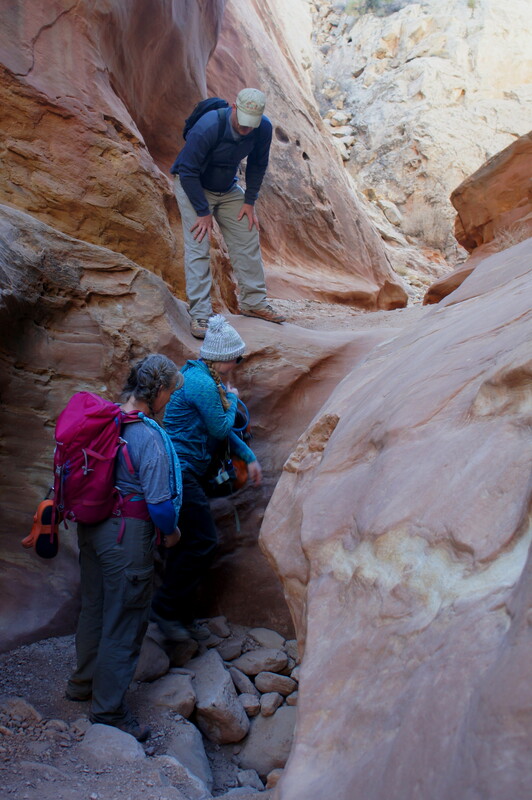 Working your way back down the rock layers, the next is the Navajo sandstone—responsible for a large percentage of slot canyons in the American southwest. 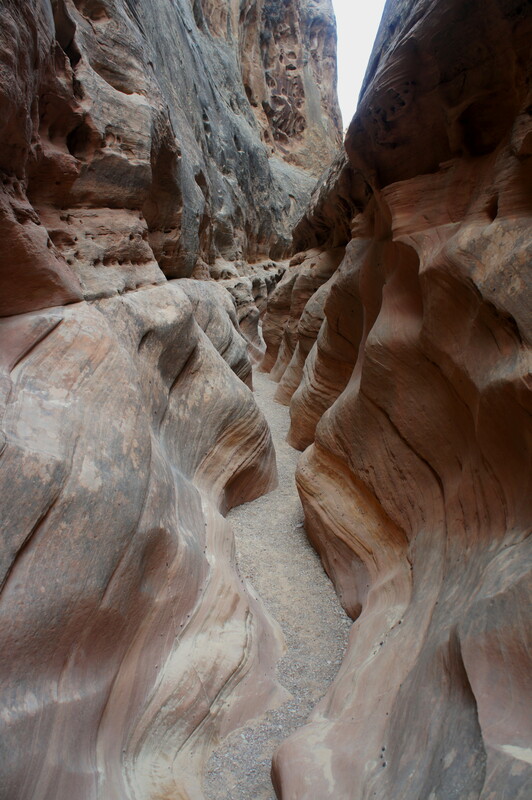 The canyon opens up for a short while as the wash rounds a series of bends. Then, all of a sudden, the walls compress, and the fun begins. The section that follows is better considered narrows than a true slot (as a general rule, if your outstretched arms cannot reach both walls at once, it’s hard to call it a slot), but the fluted cliffs are highly ornate. Crossbedding, black streaks of desert varnish, and holey solution pockets rule the day. 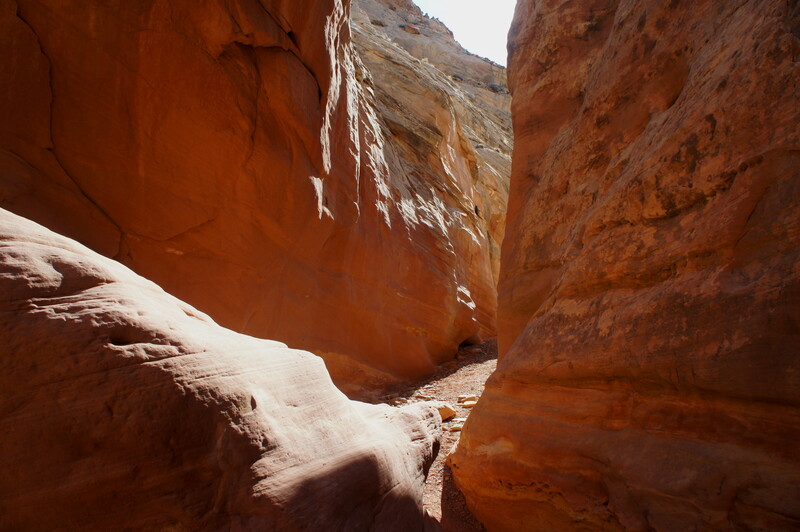 The narrows are followed by three tranches of true slots, segmented by brief open areas with plenty of sunshine. Each slot appears smooth, wavy, and multicolored. Depending on the angle and amount of light available, every bend has a slightly different feel—look both backward and forward while traversing the slots for a diversity of views. All three sections are relatively straightforward: razor thin, but free of any major obstacles. 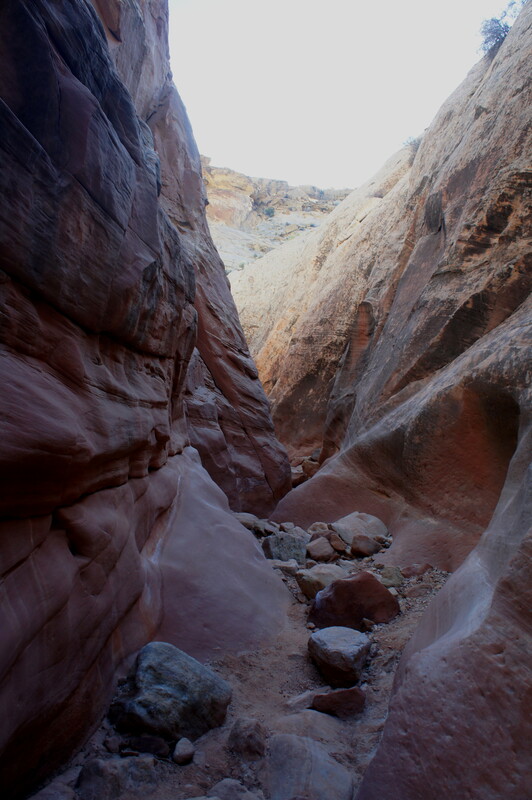 Following the third slot, Little Wild Horse Canyon opens up again for a final time. A rather excessive display of man-designed rock cairns tops a large stone on the left. A few minutes’ walk returns you to the canyon junction. From here, it is ½ mile back to the trailhead. 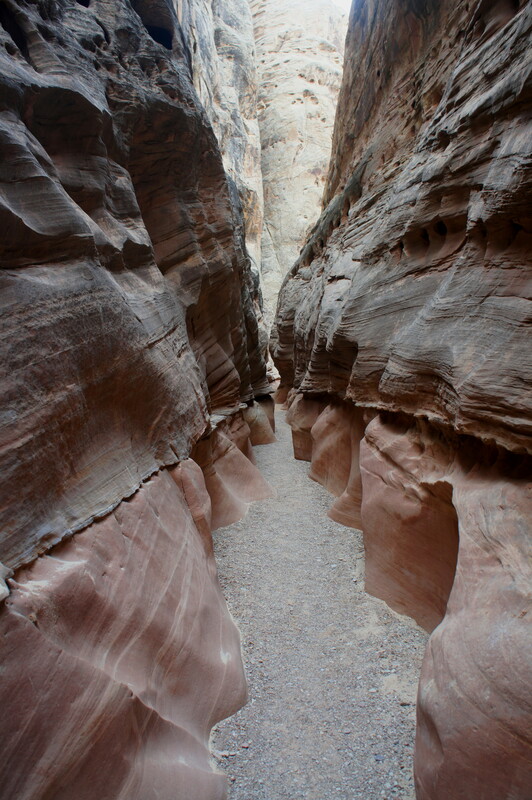 This entry was posted in Moderate Hikes, San Rafael Swell, Utah and tagged Behind-the-Reef Road, Bell Canyon, canyon, Kayenta formation, Little Wild Horse, Little Wild Horse and Bell Canyons, Little Wild Horse Canyon, Little Wildhorse, Narrows, Navajo sandstone, San Rafael Reef, San Rafael Swell, slot, Utah, Wingate sandstone. Bookmark the permalink. Just did this hike, yours is the absolutely best guide I have read. It isn’t as easy as some people made out, but it also isn’t difficult if you know that there are bypasses in some area. I wish I’d known about the bypass for the last obstacle going up little wild horse. I will go back and look for it. Also, being afraid of falling, I can tell you that the bypass trail for the first obstacle was terrifying to me. It didn’t help that people had young children up there that weren’t holding onto anybody’s hands. I will go the way you suggested, just to the left of the first rock. Thanks for your comment. Glad to hear the description was useful!